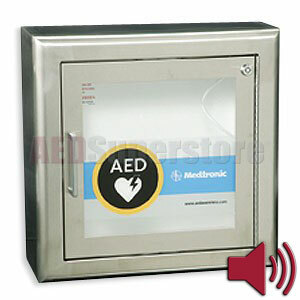 Physio-Control Surface-Mount Stainless Steel AED Cabinet with Audible Alarm. When good looks matter, this sturdy and attractive cabinet is ideal for both indoor applications and sheltered outdoor applications. Door-activated audible alarm alerts everyone in the area the AED has been deployed for rescue. Compatible with LIFEPAK 500, LIFEPAK 1000, LIFEPAK CR Plus and LIFEPAK EXPRESS Defibrillators. Steel with Steel Trim and 7" Return. The window is constructed of Lexan polycarbonate.